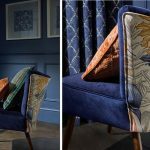 The MALDIVES collection – A collection of vibrant prints, teamed with contemporary leaf designs, detailed embroideries & textural velvets. Available in 6 distinct colour palettes; Caribou, Reef, Lagoon, Pomegranate, Marine & Begonia. An energetic, tropical vibes, fun & bold range. The PEMBURY collection – A beautifully classic collection, offering a stylish and timeless approach to both contemporary and traditional interiors. Available in 5 classic colour palettes; Thyme, Cranberry, Henna, Pewter & Glacier. 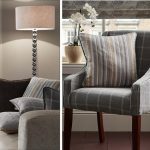 A beautifully varied fabric range, including Art Deco prints, timeless stripes, classic florals, checks & textures. The ORIENTALIS collection – Boasting decorative chinoserie scenes, trailing florals & structured geometric designs. Available in 6 contrasting, pastel & bold colour palettes; Delft, Duckegg, Jet, Jade, Blush & Saffron. 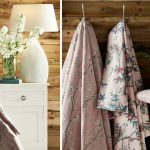 An elegantly detailed fabric range, with floral patterns, natural tree and leaf designs, delicate embroideries and soft prints. The VOILES 1 collection – A large varied collection of textured and patterned voile, sheer fabrics. Inclusive of geometrics, stripes, damasks, slubs & textures. This collection will allow you to incorporate a statement window dressing, whilst practically providing a sheer window covering. 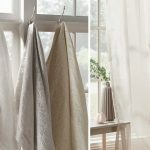 All voile fabrics in this collection are unique to one another, this stylish range has 10 different designs, available in 6 stunning neutral colour palettes; Ivory, Champagne, Neutral, Mink, Ash & Slate. The combination of bright classic tones, with cool toned modern colours & warmer middle taupe tones; creates the perfect versatile voile collection, with a fabric bound to suit any interior/window.